Vitalitymoves facilitates 6 week courses of Calm Mindfulness. 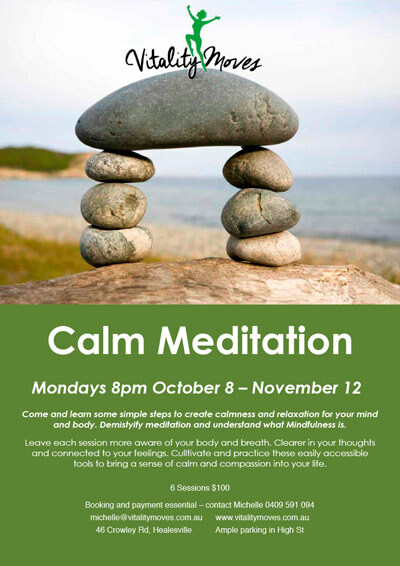 Come and learn some simple steps to create calmness and relaxation for your mind and body. Demystify meditation and leave each session more aware of your body and breath, clearer in your thoughts and connected to your feelings and emotions. In each session we use body scanning but also explore other techniques such as mantra, yoga Nidra and metta meditation. Clinical studies of Mindfulness Meditation have shown that regular practice helps combat stress, improve sleep, enable greater concentration, boost the immune system and increase resilience and creates a more compassionate life. Michelle has been meditating for over 20 years. Her introduction was initially on 10 day silent retreats and has more recently trained in Mindfulness based techniques. Meditation is not a way of making your mind quiet but a way of entering the quiet. It is a way of entering the quiet that is already there – behind the 50,000 thoughts we have each day of which 95% is repetitive. $100 = 6 weeks 8-9pm Monday nights, booking essential. I just wanted to send you a quick thank you for the six week meditation class I attended. I learnt a lot about meditation itself and learnt that I didn’t really know much! It was great to learn that meditation can be as little as seven breaths, which I use on a regular basis. I am now in the process of making meditation a daily ‘habit’ as it helps me (and my body) cope with the rest of the day.